I have read previous books by Angela Hunt and have enjoyed her historical fiction immensely. This was the first contemporary fiction romance novel of hers that I have read and I literally could not put this book down and finished it in one day! 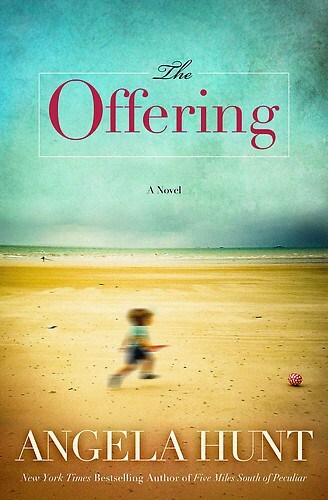 The Offering (list price $14.99) is set in Pinellas County, Florida which is the place of my birth so it was very interesting to recognize the location and could imagine the fictional stores and setting. 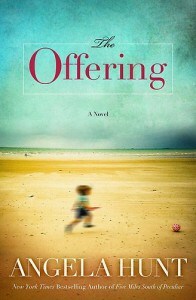 I have also personally struggled with carrying a child to term prior to giving birth to my three blessings so the topic of this book was emotionally raw and powerful for me. This story introduces us to the main character, Amanda Lisandra who is a loving military wife and mother of a young daughter. She struggles with living the American dream as she and her Cuban-American husband are having trouble making ends meet on a limited income. When she learns that she can become a surrogate mother and give a loving family who are unable to conceive a much longed for child it sets in motion a series of events that ultimately concludes in a shocking ending. An unexpected tragedy occurs as Amanda is planning to give birth to the surrogate couple’s child and the pain of her loss is overwhelming. Two years later she will receive a card that changes the course of many lives forever…………….has the unimaginable happened? The author expertly tackles the very sensitive topic of infertility and the surrogacy. It also weaves in a very realistic way the effects on relationships and families. As someone who was adopted by my Mom, I also appreciated the side story that the author brought into this book which explores her cousin by marriage that is unable to conceive a baby with her child and pursued adoption. I found myself conflicted at several times in the book with the difficult decisions made by the characters and felt so many different emotions at the conclusion of this book. It ultimately reinforces my belief that love for a child can be felt deeply on so many different levels whether they are brought into life by birth, surrogacy or adoption. This is a must read book for the summer if you appreciate an honest, raw story about the complexity of human relationships. Reading a story that has some personal connection, like growing up in the same location where the story takes place, would really add a deeper connection for me, as well. I really enjoyed your review. This story sounds like something I could really get into. Thanks so much for your insight. Sounds like a beautiful and emotional story! I look forward to reading this soon! Thanks! Always looking for new ideas! Very touching and powerful! I can tell that you were deeply touched by this. I can’t even imagine some of the issues being dealt with here. Surrogacy is amazing but very emotional. It sounds like this book does a good job of weaving together people’s lives and the occurrences that affect and change us all. Awe this sounds like it would be a great read, thanks for the review! Sounds like an amazing story. You hear more about surrogacy and other ideas when other woman are willing to help those who cant conceive. It is not the way to go for everyone and not ever one could be a surrogate mother either. Okay so I’m not a romance reader, but your review has me already wanting more! I’ve never read this author but the story sounds full of life and a great read! Thanks for the review, you did well!